Congresswoman Alma Shealey Adams currently represents North Carolina’s 12th Congressional District in the United States House of Representatives. She is the 100th woman elected to that legislative body and the second African American woman, after Eva Clayton, to represent North Carolina in the U.S. Congress. Born Alma Shealey on May 27, 1946 in High Point, North Carolina, she is the daughter of Benjamin Shealey and Mattie Stokes. She graduated from West Side High School in Newark, New Jersey in 1964, but returned to North Carolina to attend North Carolina A&T State University in Greensboro, North Carolina where she received her B.S. degree in 1968. In 1972 she earned a master’s degree from the same institution, and in 1981 she received a Ph.D. in Art and Multicultural Education from The Ohio State University. In 1974 she began what would become a forty-year career as a professor of art history at Bennett College in Greensboro. Adams began her political career as the first African American on the Greensboro City School Board, where she served until 1986. The following year she was elected to the Greensboro City Council, where she remained until her appointment in 1994 to a vacant seat in the North Carolina General Assembly, the state legislature. Adams was appointed to fill the seat in North Carolina House District 26 that was filled by Herman Gist, who died in office. She won the primary election against fellow Democrat O.C. Stafford, and in the general election she defeated Republican Roger C. Coffer. Adams easily defeated other opponents in every two-year election between 1996 and 2012. During her time in the North Carolina General Assembly, Adams initiated or supported legislation that promoted the interest of children and families. She was responsible for pushing legislation that raised the state’s minimum wage, advocated affordable health care, and led affordable house initiatives. Adams also served as the chairperson of the North Carolina Legislative Black Caucus and the North Carolina Women’s Caucus. Adams entered the U.S. House of Representatives after a special election in November 2013, filling a vacancy created by former Representative Mel Watt when Watt was nominated by President Barack Obama to become Director of the Federal Housing Finance Agency. Adams ran simultaneously in 2014 to fill the unexpired term of Watt (November 4, 2014 to January 6, 2015), and for a full two-year term in the 114th Congress (2015-2017). She won both contests and was sworn in on November 4, 2014. Adams currently serves as vice president of the 114th Congress’ freshman class, a Regional Whip, and is a member of the Committee on Education and the Workforce. Representative Adams is the mother of two children, Linda and Billy. She is a member of Alpha Kappa Alpha Sorority, Inc., and of the New Zion Baptist Church in Greensboro, North Carolina. 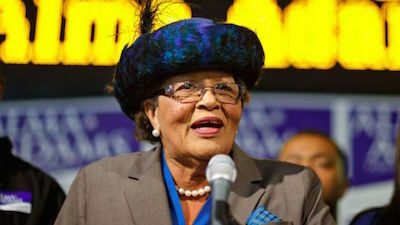 "Alma Adams for Congress: About Alma," http://almaadamsforcongress.com/about; "Full Biography: Congresswoman Alma Adams, December 11, 2014, http://adams.house.gov/about/full-biography; Alice Ollstein, "Meet Alma Adams, Who Becomes The 100th Woman In Congress Today," ThinkProgress, November 12, 2014, http://thinkprogress.org/election/2014/11/12/3591247/alma-adams-100th-woman-congress/.